Craig Howe, the CEO and founder of Rebel Ventures, explains how he watches the Games from a digital and social perspective. As the Rio Olympics captivate sports fans worldwide, tremendous branding opportunities—and potential pitfalls—for companies (official Olympic sponsors or not) and athletes abound. Craig Howe, CEO and founder of Rebel Ventures, a leading sports digital strategy firm, offered us his digital expertise and discussed why these Games are different than any other Games due to the abundance of live digital content and the impact this will have on athletes and brands as they engage with global audiences on the biggest stage in sports. SportTechie: What do you classify as extreme overuse of social media and digital media? And how might this hurt the Olympics viewing experience for fans either on digital platforms or on television? Craig Howe: The way that this story has been unfolding has been really fascinating to me. I did quite a few interviews around Sochi when the #SochiProblems hashtag started to trend. At that time you didn’t have Facebook Live video or Periscope where pretty much anyone can become a live broadcaster. Therefore, a lot of the coverage that we saw around Sochi was images of people having different experiences. There was a bobsledder who had to break through the bathroom door because he got locked in. So it’s one thing to show that in an image and one still picture, and it’s a whole other ballgame when you’re able to actually broadcast live. As we know, Brazil is a social media-laden society, so with the social media tools available there is a combination of now having tools where anyone can become a reporter, especially Olympic athletes, and live broadcaster. And Olympic athletes are really used to having their income stem from building their own personal brand and followings. So my big fear as we move through the Olympics was that every brand and athlete would be using live video to the point where the oversaturation is so heavy that you don’t really know who to follow. In some ways it’s a digital consumption dream, but in a lot of ways it’s really hard to break out of the clutter when everyone is trying to use the same mediums. Now that so many brands and athletes see digital as a primary way to cover the Games and to showcase their involvement, I was expecting extreme overuse of social. However, kind of a funny thing happened. If you look at the actual rules, it says that no unofficial Olympic sponsors can associate with the Olympics on Twitter, Facebook, Snapchat and Instagram. Athletes can be disqualified or stripped of medals if they violate a rule of using social media during the Olympics, and there is a big blackout period for that. That was really my big fear for heading into the Olympics—that it might be really hard for anyone to stand out because everyone is going to be so proactively using digital and social means to communicate their story. 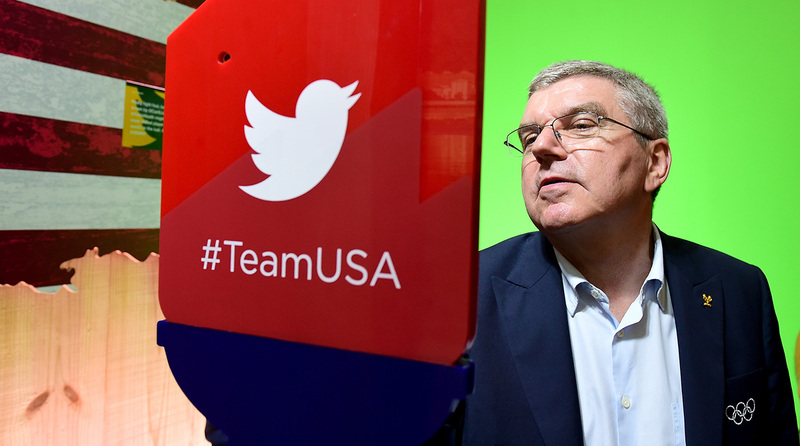 ST: What do you think this influx of new digital and social media platforms, such as a Facebook Live or a Periscope, will provide for brands and athletes that we haven’t seen before at Olympic Games? CH: I would say that with Periscope and Facebook Live, you really have the opportunity to convey the emotions that the athletes go through. I can’t even imagine intensely training for something for four years and it all leads to that one moment. ST: Are there any brands or athletes that impressed you with their digital content production? CH: I was really inspired by what Under Armour did with Michael Phelps because I feel like what is never really showcased enough is the level of training and intensity that goes into preparing for these moments. All that Under Armour did across traditional and digital media kind of gave me goose bumps. ST: For brands that are not an official sponsor of the Olympics, and therefore have limitations on their messaging capabilities, how do they still take advantage of the Olympics in a meaningful way? CH: I realize that the IOC is strict with their brand as they are just trying to protect their partners and get the most out of their involvement. But what I really love about the creativity in social media is really savvy, really well staffed, really creative and graphically driven brands will find ways to take advantage of the limitations and evolve the conversation to where it doesn’t fit within the official narrative but it fits within the narrative that the social media world creates. So I really look to see how every brand and athlete is going to be able to take advantage of these great moments without violating any of the IOC policies. ST: How did the governmental and health issues facing Brazil impact the digital landscape around these Olympics for brands and athletes? CH: With the IOC saying that athletes can be disqualified or even stripped of medals if they violate the rules, I think they are basically communicating that they learned from the past. With the #SochiProblems hashtag, I believe that the organizations that are heavily invested in the Olympics are doing what they can to minimize negatives and focus on the positives this year. What happened in Sochi was so intriguing to me because going into the Games, everyone was saying “this is such a disaster and there are all these problems.” But a funny thing happened: As soon as the Games started, the stories from the competition started to totally take over. ST: Is there anything about Rio specifically that gives it unique digital possibilities compared to previous Olympic host cities? CH: Absolutely. During Sochi, if you look at T. J. Oshie, who is a player for the Washington Capitals, he and his wife noticed that there were many stray dogs in Sochi. So they actually brought one home and chronicled the whole journey on digital. That was one of those memories where you see people that aren’t just going to the Olympics for the time that they are participating. They actually find a way to connect with the city. ST: What specifically from a digital content perspective should we be watching for with athletes telling their stories? CH: Now that we have more technology and more ways that we can share experiences around the Olympics as an athlete and a brand, is that window of coverage and the window of connection with fans going to be longer with more digital options available?